Still needing to use up a huge bag of oat bran, I found this recipe, excited to try something "meaty." Tempeh is basically a fermented soybean cake...sounds gross, I know, but if cooked properly, it can be worth a try. 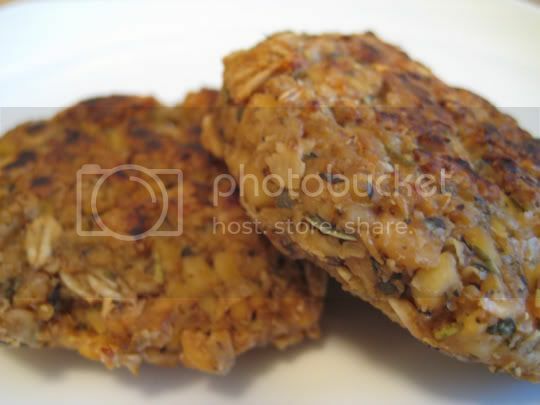 With the exception of the "sausage" patties not holding together very well (even after chilling in the fridge), the taste is delicious: salty, savory, and hearty, with that herb-y, sage-y flavor found in those "maple" sausages. The texture was good and firm, albeit a bit crumbly upon digging in with a fork. I cooked them just long enough to get that nice, almost burnt flavor on just the tops. I ate these with the Oatmeal-Apple Waffles (it was an oat bran morning), and sopping up the extra maple syrup on the plate with them took these babies to a different level of tastiness. Make again? Yes. These would be great in sandwiches. I'd probably halve the recipe next time, as these made about 12 two- to three-inch patties.